I am happy to say that I completed a whole year of of the DLP (Documented Life Project) in 2014. I LOVED it. 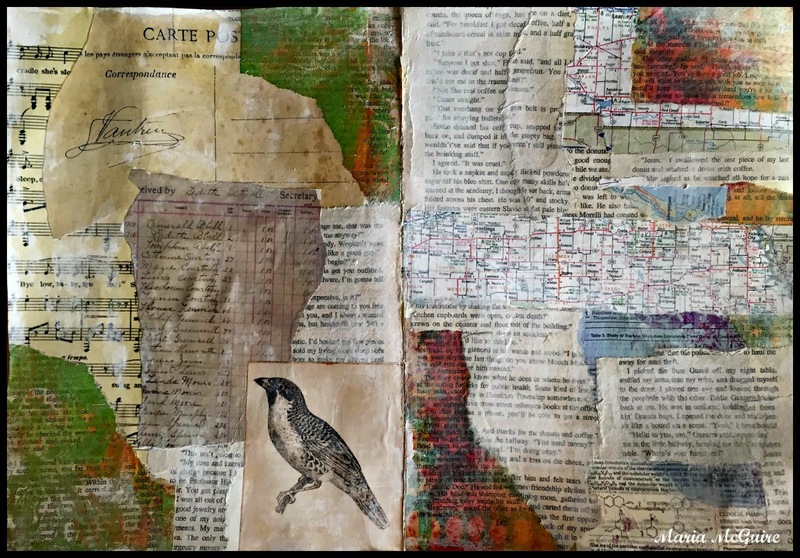 It brought me back to my scrapbooking days and incorporated mixed media story telling at the same time. I am determined to keep it up this year!!! As a matter of fact I'm going to do the "new version" of DLP and keep do another version in a Moleskein to match my one from last year. Okay...my other news...I have a NEW love!!! Well it really isn't new, but some of the products are. of products to play with. 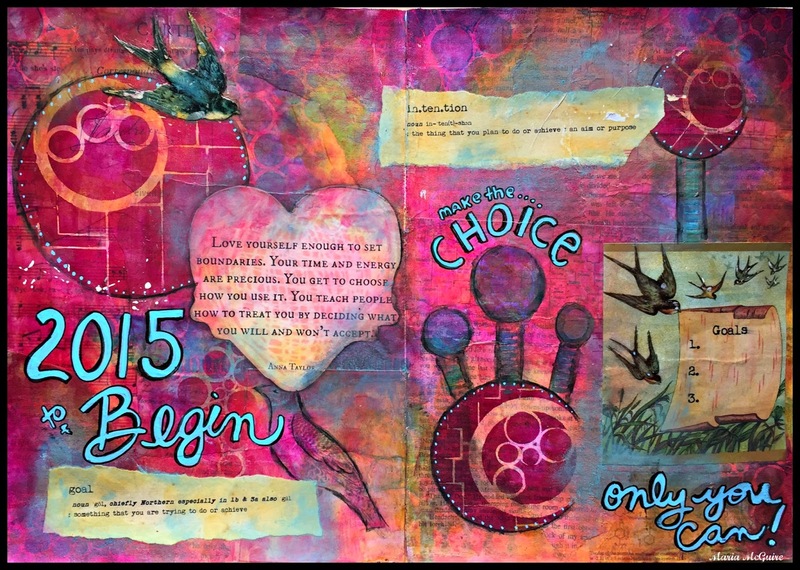 NEW journal, new products = FUN!!! 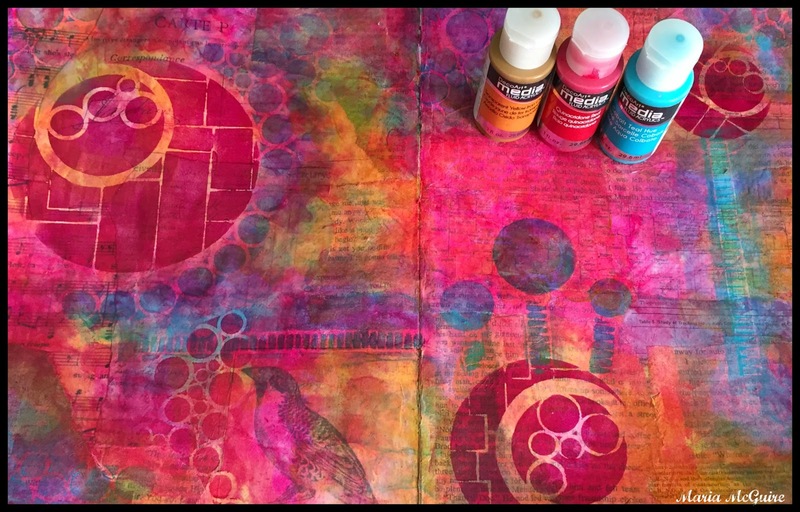 I have long been in love with the DecoArt Traditions color Permanent Alizarin Crimson. In LOVE I tell you! Well....now I am in LOVE even more with the new Media line of Fluid Acrylics. I can't tell you how excited I was when I played with them. They are like a fine art paint but don't leave that sticky surface on your page. Not matt, not shiny....but somewhere in between. Here is a little look at what I did with some of the products. The challenge in the first DLP page was to use book paper. 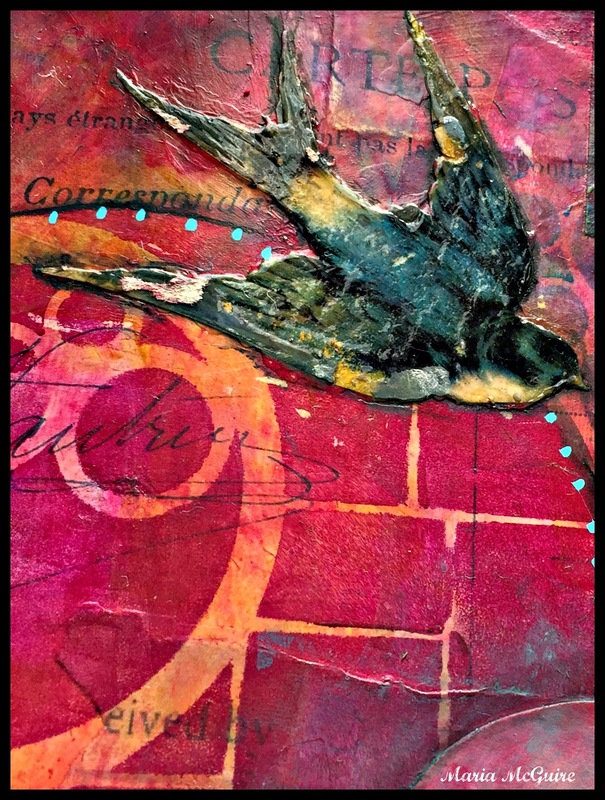 I laid down book paper in my Dylusions journal with the DecoArt Media Matt Medium and then when it was dry scrapped over the page with some of the DecoArt Media Gesso. 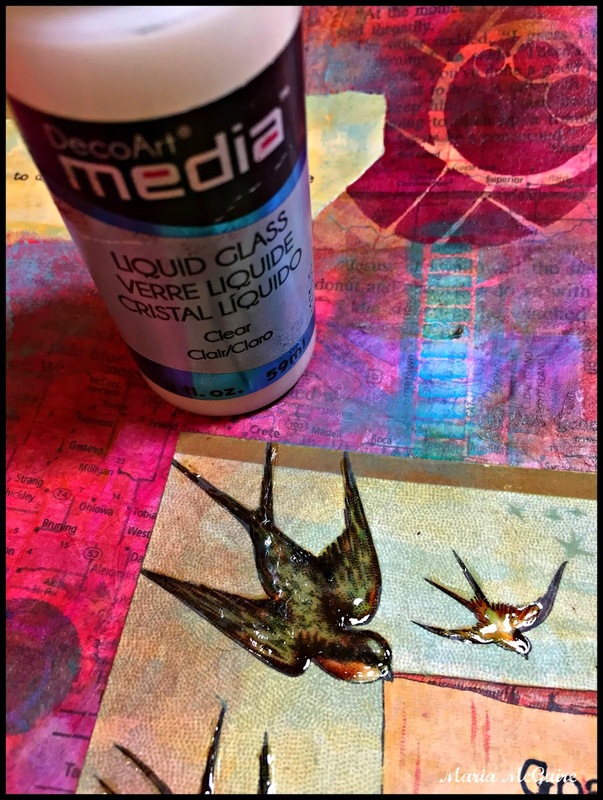 LOVE the feel of this Gesso--so smooth!!!! I think took just a few drops of the DecoArt Fluid Acrylics and a very wet brush and made a watercolor type wash over the page. It took so little paint to get a rich color. Let's try that fluid acrylic with a stencil! 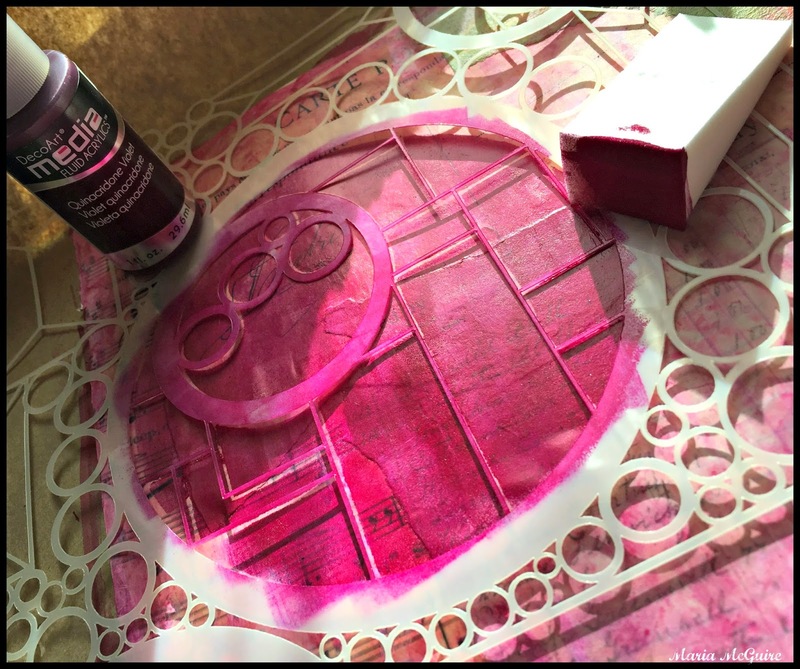 I picked two of my two new stencil designs from StencilGirl Doodle It Dream Landscape and Doodle It Geometric Landscape and used a make-up sponge with the Quinacridone Violet to stencil bits and pieces of both stencils over the spread. Yes! I'll take a gallon of that color thank you!!!!! I then added a few more colors of fluid acrylic on the page. Let's try that Antiquing Cream! I really love how it gave an aged look to my paper and so easy to use. It even has a really great texture. Last, but not least, I couldn't wait to play with the Liquid Glass!!!! It did not disappoint! Pictures just can't do it justice. I think it dried quicker than any other product like this that I have ever tried. 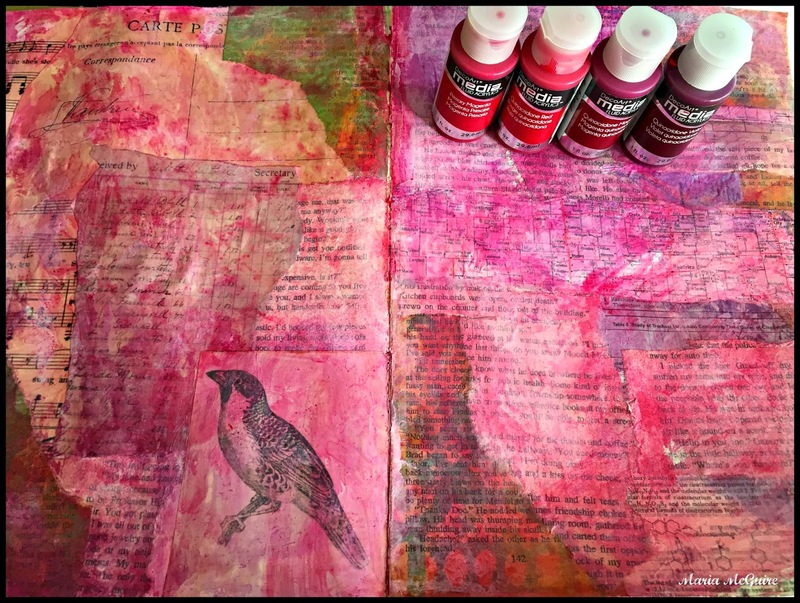 I thoroughly enjoyed playing with these products and am SO in love with the paint. I love the size of the smaller bottles too because it makes it easy to travel with which I'm going to do soon! 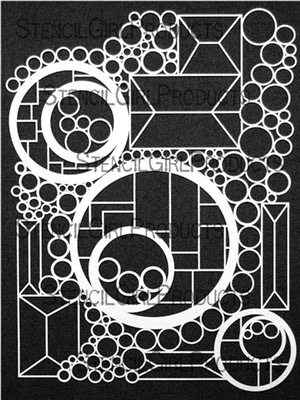 will be on StencilGirl Talk tomorrow. Of course, I'll be back here soon on my blog playing with the products a little more too! This turned out awesome! Love how you did your background, and you're making me fall in love with that color too! 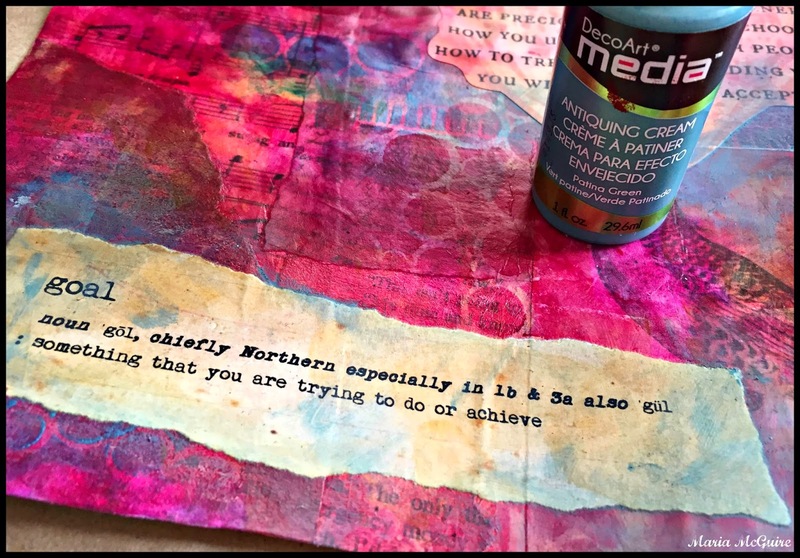 I might give teal a break now and then ;) Love your painted handwriting too (you painted the words, right?) Looks so cool. Beautiful page! I participate in DLP as well. Did 2014 and it was the first time I stuck with a project the entire year! 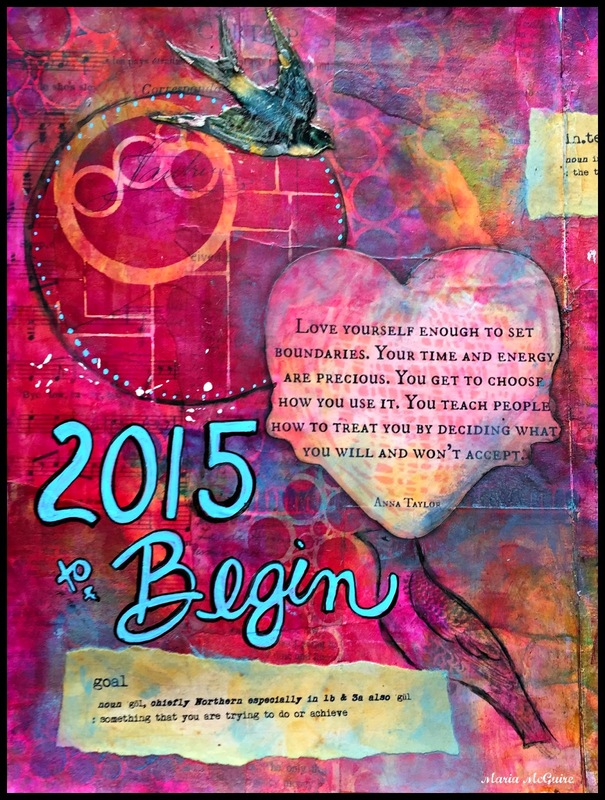 Already started 2015 too. Such a great project. 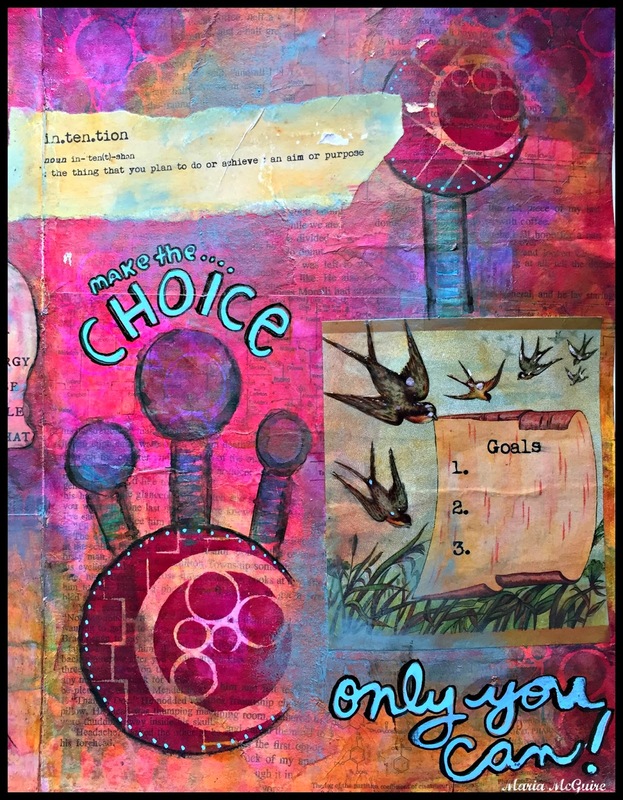 Gorgeous pages Maria! I am going to have to get my hands on some of these products next time I am in the states!! Great work! Ohhhh...Love these! Great Colors! Never saw an antiquing cream in that teal color before! Really pretty! I LOVE the Antiquing Cream!!! Used it a few times now--great product! Wonderful and inspiring--love the liquid glass. These are new products for me. Now I will be on the lookout. Thanks for sharing! Thanks for visiting Rebecca! I'm IN LOVE with the products! Holy moley. .what a gorgeous layout. I can see why you love them. Totally fabulous! Pinned. Love your colors and your intentions. 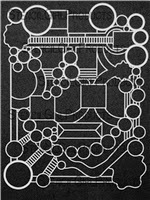 And I just bought that stencil of yours on the left, too - can't wait to play with it!